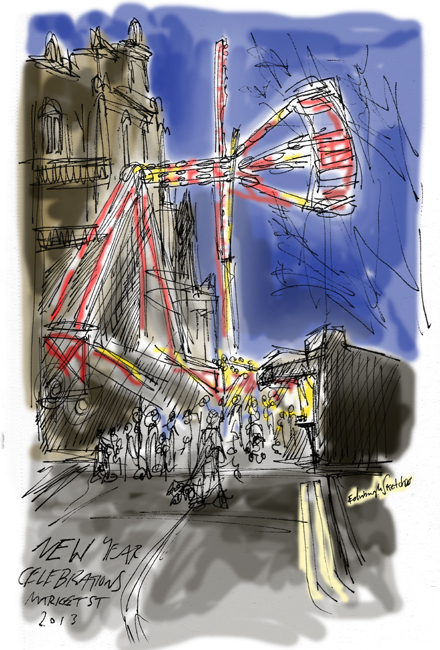 You may be forgiven for thinking Edinburgh’s city centre was already full of thrilling rides and attractions for Edinburgh’s Christmas, but in the past couple of days the familiar site of Market Street lit with fairground rides and excitement can be seen leading up from Waverley train station to the Mound. A pendulum of thrill seekers swings out towards Princes Street Gardens as one ‘lucky’ reveller looks to be ‘catapulted’ into the night sky in what looks to be a large ball on bungee rope! I admit I felt quite jealous of those arriving in the city for Hogmanay, it must be like landing in a magical land of lights and attractions, surrounded by stunning architecture and beautiful scenery. My sketch was drawn on location, and coloured digitally later.